And the award for the smoothest ever landing by an airline pilot goes to … Aer Lingus’s Captain Orla Clancy. Either the tyres on her Airbus were filled with feathers or the runway at Munich airport is made of marshmallows. Either way, it was the softest possible start to my first visit to Bavaria, and more precisely to Regensburg where the BMW 3 Series is manufactured and they brew the most wonderful beer. Another revelation was that the Danube which flows through this beautiful medieval city is brown, so Austrian composer Johann Strauss II, who composed The Blue Danube in 1866, must have been colour blind. Probably the most instantly-recognised piece of classical music, and my favourite, it was quickly adopted as Austria’s unofficial national anthem and is played on state television and radio at midnight every New Year’s Eve. On the 12th century Stone Bridge over the river it was music of the green, white and orange variety that had drawn a small, appreciative audience around Limerick-born Pat Cooksey. This is the guy who wrote The Reason I Left Mullingar (1980), recorded most famously by The Fureys and Paddy Reilly and dedicated to the thousands of Irish labourers who left home to seek work on London’s building sites in the 1970s. Pat’s comic classic The Sick Note, which he wrote in 1969, became a huge hit when the Dubliners in Europe and The Clancy Brothers in the US introduced it to packed houses on their tours. Pat, 66, who commutes the 90 kilometres from Nuremberg where he lives, was in his regular daytime spot on the bridge belting out Raglan Road when I approached. 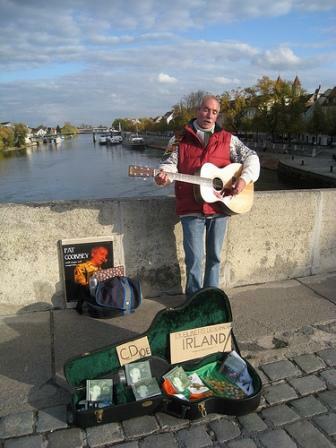 If the pile of coins in his open guitar case was any indication, he’s hit the right note with passersby. He’s certainly popular in his adopted hometown, where tickets for his evening gigs are always in big demand. Just over 900,000 out-of-towners including foreign visitors (mostly long-weekenders) chose to stay one or more nights in Regensburg last year, while more than three million spent a day exploring its lovingly-preserved architectural gems. We can thank Allied Bomber Command for there being so much to see — during World War Two they flattened the nearby Messerschmidt factory but spared the city. Regensburg, which is 100 kilometres from Munich, is home to the wonderful Regensburger Weissbrauhaus restaurant with its in-haus brewery and meat from animals reared by the owner. Going by the size of the cuts, he must be running a German version of Jurassic Park. I had a couple of big wheat beers and a plate of succulent roast pork with what looked like a giant boiled potato. It turned out to be a super-absorbent dumpling that you cut in half and put face down in the gravy. The development people at Valeda are missing a trick — if they buy every dumpling they can lay their hands on and stick broom handles in them they’ll have invented the mother of all mops. They’d wipe the floor with their rivals and clean up. The citizens of Regensburg, where vegetarians fear to tread, love their food and the restaurants don’t skimp on the portions. On my first night in town I dined in the restaurant of my hotel, the Orphee, where the rooms are full of antique furniture and the guests are full of fabulous food when they retire to their big beds which are as soft as Captain Clancy’s landing. I ordered a salad to start and a main course of ragout with cous cous and immediately regretted it when the waitress brought an allotment on a plate followed by a bucket-sized tureen teeming with chunks of delicious spicy lamb. A quarter of the way through I thought of asking for a doggy bag, but I not only don’t have a dog, I don’t have an Irish wolfhound. The restaurant, which was packed, is open to all and reasonably priced. 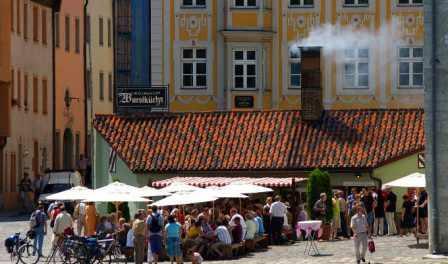 The most expensive pint of lager I had during my stay in Regensburg cost €3, but the best was the one with which I washed down a great lunch of sausages, mashed potatoes and sauerkraut in Die Historische Wurstkuchl (Historic Sausage Kitchen) next to the Stone Bridge. Don’t expect an extensive menu — this place serves nothing but sausages, 6,000 of them a day in portions of six, eight or 10, and has been doing so for 900 years. The first customers were the men employed in building the bridge, but today the cosy interior and the terrace are packed all day long with office staff and tourists. I visited the Sausage Kitchen during my walking tour with guide Michaela Ederer (tickets from the tourist information office at 4 Rathausplatz). We set off from the remains of Porta Praetoria, the 1,833-year-old stone gate in the northern wall of the Roman fortress Castra Regina that was built for the Third Italic Legion who, despite their name, were an upright body of men. 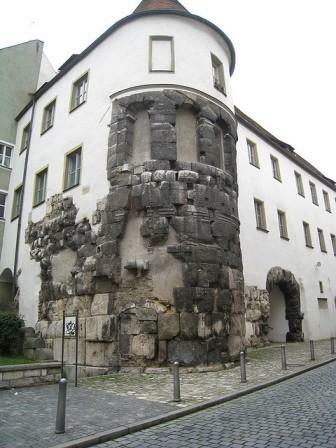 In the sixth century Castra Regina, by then called Reganespurc, was accorded the status of first capital of Bavaria. Six hundred years later, the Stone Bridge helped turn the city into one of the wealthiest in Europe by opening up lucrative trade routes that stretched east to Kiev, west to Paris and south to Venice. Fast forwarding 500 years to 1663, Regensburg became the seat of the Imperial Diet of the Holy Roman Empire, but that distinction ended in 1806 when the empire was dissolved. This was probably because the Dieters could no longer resist the smell of all those sausages sizzling away in the Wurstkuchl as they made their way to and from their Weight Watchers sessions. Next stop on the tour was Saint Peter’s Roman Catholic Cathedral, built between 1275 and 1634 with the towers being a later addition completed in 1869. Accommodating 6,000 people, which is three times the population of 400 years ago (Regensburg is now home to 150,000 people), it’s one of the finest examples of French Gothic architecture and a bit of a rarity this far south. The facade is festooned with more gargoyles than you’ll see in a Hammer horror film, plus many statues and carvings of knights and kings on horseback, while inside the statues of the Virgin and the Archangel Gabriel where the transepts and the nave meet are much admired, as is the silver high altar. Saint Peter’s is packed on Sunday mornings when regular worshippers and visitors gather for mass and to hear the Regensburger Domspatzen (Cathedral Sparrows), the renowned choir that was conducted from 1964 to 1994 by Pope Benedict’s elder brother, Monsignor Georg Ratzinger. The Pope himself was Professor of Dogmatic Theology at Regensburg University. 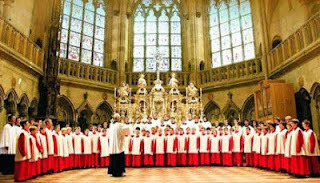 The choir, composed of boarders and day pupils from the cathedral’s boys schools, have toured the world and sung for pontiffs, monarchs and heads of state. 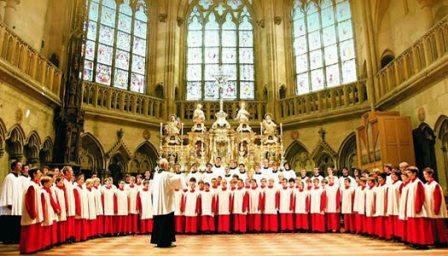 If you’re lucky enough to be in Regensburg when they’re there you’ll find it a very moving experience. I can’t claim to be in any way religious, but as I sat in the cathedral listening to the Sparrows I felt a lump in my throat. Saint James’ Scottish Church is the most notable building in the abbey complex known as Die irische Benediktinerklosterkirche St. Jakob und St. Gertrud, which is even more of a mouthful than one of those dumplings. Founded in the 12th century by Irish missionaries, the abbey had close links to the monastic school in Cashel, County Tipperary. In 1577 a papal bull transferred the complex to monks from lowland Scotland, led by Abbot Ninian Winzet who was a fierce critic of Catholic-turned-Protestant church reformer John Knox. Their task, on the orders of Mary, Queen of Scots, was to train priests for missionary work back home, but it wasn’t until 1623 that the first one was dispatched. The decorative and figurative carvings on the north portal of the church, the Schottenportal, have intrigued historians for centuries. Many are straightforward depictions of Christ, the Apostles, saints and Adam and Eve, but others are a mystery, and where mystery exists mysticism is soon attached. 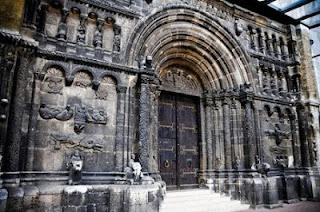 Comparisons with the enigmatic Rosslyn Chapel not far from Edinburgh which features so prominently in The Da Vinci Code have lately been widely circulated, but there are countless more sceptics than theorists. The arguments about hidden messages and cryptic pointers to the location of the Holy Grail — one of the most popular theories — will no doubt rage until the Danube runs dry. Not to be sniffed at is a visit to Regensburg’s quirky Snuff Museum in the former premises of the Bernard Snuff Factory at 3 Gesandtenstrasse (it should be called Gesundheit! Strasse). 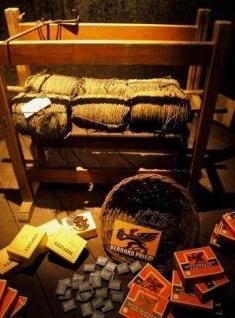 Forty varieties of snuff were produced here, and the aromas emanating from the original wooden machinery still hang in the air. Quirky too is the Important European Golf Museum at 3 Tandlergasse where among the items on display is what’s claimed to be the world’s oldest golf ball dating from 1525 and a huge collection of clubs that charts the evolution of the game. I’ve no great interest in golf, but at least I now know that before the club numbering system was introduced in the early 1930s by Spalding, players employed cleeks, brassies, mashies, spoons, baffling spoons, niblicks and jiggers. The most interesting exhibits are a couple of rare Sabbath sticks, a throwback to the dark days of long ago when the killjoy Free Presbyterian Church of Scotland — the Wee Free — warned of damnation for those who dared to follow leisure pursuits on Sunday. Sabbath sticks, therefore, were golf clubs disguised as walking sticks with the head hidden in the palm of the hand. When the undercover golfer was sure he was out of sight he’d upend his stick and wallop a few balls without fear of being denounced from the pulpit. Regensburg resident Franz von Taxis (1459-1517) eschewed the obvious career choice of becoming a cabbie and set up western and central Europe’s first successful widespread postal service. Von Taxis was postmaster to Holy Roman Emperor Maximilian I from 1489 and King Philip I of Spain from 1504 and was granted a monopoly to carry both courtly communications and public mail, which turned out to be a licence to print money. At the height of its operations, the service employed 25,000 dispatch riders and mail coach crews. The hereditary monopoly — what I call heir mail — maintained until 1806, but that was OK, because by then Von Taxis’ descendants were sitting on a monstrous fortune. 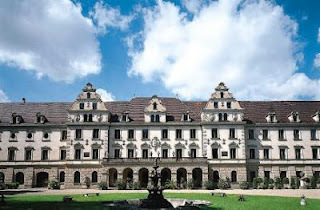 In recognition of the services rendered by Franz and his descendants, the family was rewarded in 1812 with the gift of the eighth century Saint Emmeram’s monastery which they renovated, fancified and renamed Schloss Thurn und Taxis. This 500-room palace, among the first in Europe to have electricity, flushing toilets and central heating, is now one of Regensburg’s most visited and beautiful historical buildings and home to 29-year-old Albert II, 12th Prince of Thurn and Taxis. When his father, Johannes, died in 1990, eight-year-old Albert became the world’s youngest billionaire. He’s still rolling in it, and invests a lot of time and money in his passion for motor racing. The lucky devil also owns a brewery, whose Thurn und Taxis beers are readily available throughout Bavaria. This year’s Oktoberfest in Munich opens on September 22 and provides the perfect opportunity to see Regensburg. The festival is the world’s biggest annual booze-up, regularly attracting around six million thirsty revellers, but there’s only so much beer you can drink before the body rebels and pleads for mercy. 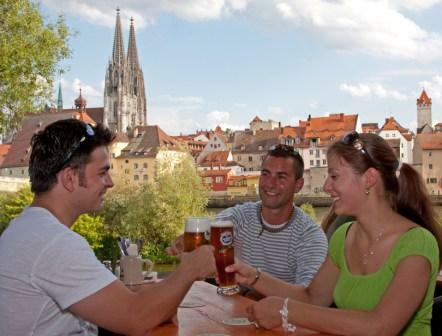 There are few better ways of giving your liver a rest and your eyes a treat, if even for only a few hours, than a day trip to Regensburg which is an hour from Munich by bus or 90 minutes by train. To see the city at its beautiful best, go in summer as I did when it’s a blaze of colour, all red and ochre rooftops and pastel-painted buildings. Guide Michaela assured me winter has its attractions too, with the place shrouded in snow and festive shoppers enjoying the Christmas market that’s smaller than but every bit as good as those in Prague, Krakow and Vienna, so a December visit is definitely on the cards. 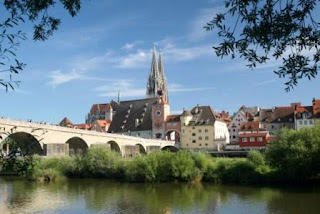 My abiding memory of Regensburg, though, is sitting in the sun with Pat Cooksey playing his guitar and singing on the nearby Stone Bridge, the Danube flowing past just over my shoulder and a big glass of ice-cold lager and a plate of sausages in front of me. I can think of wurst places to be. 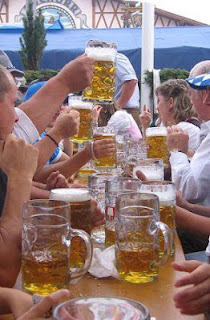 Aer Lingus (www.aerlingus.com) flies daily to Munich from Dublin and on Tuesday, Thursday and Saturday from Cork. Ryanair (www.ryanair.com) flies from Dublin on Wednesday, Friday, Sunday and Monday. Easyjet (www.easyjet.com) flies from London Gatwick, Stansted, Manchester and Edinburgh. British Airways (www.britishairways.com) flies daily from Glasgow. To visit Regensburg, take the train (www.bahn.co.uk) or the shuttle bus (www.airportliner.com/airportshuttle) from Munich. 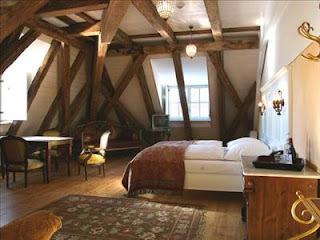 The 34-room Grand Orphee Hotel, 8 Untere Bachgasse (0049 941 596020, www.hotel-orphee.de). Die Historische Wurstkuchl, 3 Thundorferstrasse (0049 941 466210, www.wurstkuchl.de); Regensburger Weissbrauhaus, 6 Schwarze Baren Strasse (0049 941 5997703, www.regensburger-weissbrauhaus.de); Restaurant Orphee in the Grand Orphee Hotel (0049 941 52977).